This simple, colorful and tasty salad can be easily prepared during the busy work week. The tuna salad and dressing can be made in advance. All you need to do is slice the apple and assemble! I reduced the fat and calories, but not the taste, by replacing half of the mayonnaise with nonfat plain yogurt in the tuna salad! Using a fork mix the tuna, pickles, onion, yogurt and mayonnaise together. Add salt and pepper to taste. Whisk oil, lemon juice and honey together. Add salt and pepper to taste and whisk thoroughly. 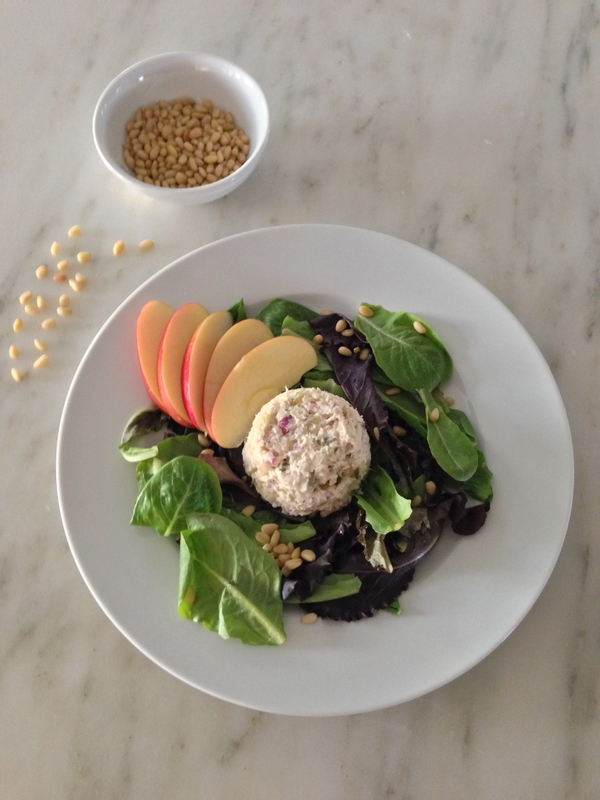 Using half the ingredients, spread lettuce on a plate, sprinkle with pine nuts, place tuna salad in the center of the plate, add apple slices and drizzle the dressing. Repeat for second plate. Serves 2.